A reserved Tier 1 table for 10. Just behind Tango tables so you can see all the action. Limited number of tables available, so reserve yours now! A reserved Tier 2 table for 10 with a great view of the dance floor! Limited number of tables available, so reserve yours now. Individual seat at an open community Tier 2 table. Individual seat at an open community Tier 3 table. Thank you to all who voted and made donations to our Dancing in the City of Stars fundraising event! All donations are tax deductible and will be applied to our Lebanese Student Civil Engineering Program. To donate to our organization throughout the year and help us continue this beneficial educational program, please make your tax-deductible contributions here. 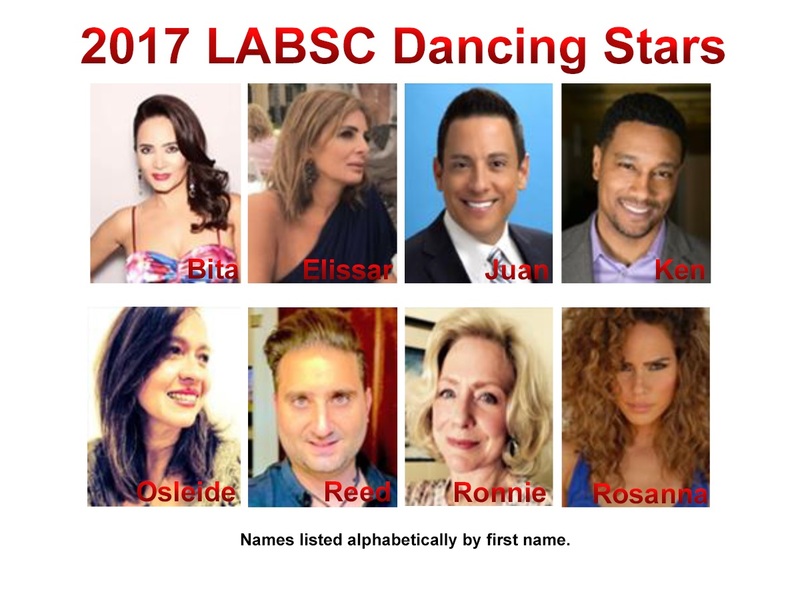 Thank you to our LABSC Star participants and their professional dance partners for making Los Angeles Beirut Sister Cities, Dancing in the City of Stars a dazzling night to remember! Thanks also to all who purchased tickets and voted/ donated before and throughout the night. It is your support that allows the Los Angeles Beirut Sister Cities Student Civil Engineering Program to continue. For information on future events and keep up with what we are doing, please visit us on our website - www.labeirut.org and on Facebook @LABeirut.org. Proceeds raised benefit LABSC's Lebanese Student Civil Engineering Education and Cultural Program. Thank you to all the professional dancers of Soho Dance LA Studio. We are a 501(c)(3). All donations are tax deductible. Questions? Email us at LABSCinfo@gmail.com!